Some lies lead to true adventure. . . .
Maeve, princess of Connacht, was born with her fists clenched. And it's her spirit and courage that make Maeve her father's favorite daughter. But once he becomes the High King, powerful men begin to circle--it's easy to love the girl who brings her husband a kingdom. Yet Maeve is more than a prize to be won, and she's determined to win the right to decide her own fate. In the court's deadly game of intrigue, she uses her wits to keep her father's friends and enemies close--but not too close. When she strikes up an unlikely friendship with the son of a visiting druid, Maeve faces a brutal decision between her loyalty to her family and to her own heart. First thing's first: I have not seen Brave. So if I'm supposed to expect Brave to be like this book or this book to be like Brave... well, I wouldn't know. I'm not entirely interested in seeing Brave. I did see Frozen though, and liked it. Anyway. I think I liked this book, but probably not enough to want to read the next book. The story/plotline wasn't that interesting, in my opinion, so it took some effort for me to finish this book. There was the plot involving Maeve finding herself, Maeve's relationship with Odran, Maeve's future... I honestly didn't care much. I liked the creation and crafting of Maeve's character - I could see her growth from a naive child to a strong young lady. I also think she could have had some more backbone, but I suppose because it's "historical-fiction"-ish, she needed to be in character with the times. 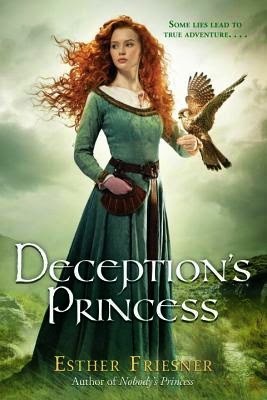 I kept reading this book, because I wanted to know what would happen, with Maeve's mother, the romance, the druids... but honestly, I didn't really care that much. Read on! Meh. That's the general feeling I got from this one. I heard a lot of people were excited about this one because it's like the movie Brave, or something like that, but I could care less. Still, it's fantasy, so I was like, why not give it a shot? I didn't really care about Maeve. I didn't care about her trying to hold her father's approval, so live for her kingdom, to help her parents, blah blah blah. She wants to follow her heart, but she doesn't. We get it. I was a little sick of her fickle nature, honestly. The romance was soooo poor. I thought Odran was a bit of a wimp, and who likes wimpy guys? Not me, anyway. I'm definitely an alpha-male-loving female... but I don't mind your average Joe. But wimps? Nahhh. No, thank you. I'm not saying Odran needed to be a warrior, or a brooding druid, or mysterious, or whatever. But... he gave off an almost feminine touch, which didn't appeal to me. Anyway. The romance. Ew. It was there but it wasn't. You can just TELL from the beginning that Odran and Maeve won't have a happy ending... and I won't spoil anything specific, but let's just say that the romance doesn't end nicely in a neat package. I didn't like the romance, anyway. I didn't care for the plot involving the animals - in which Odran and Maeve took care of wild animals. Cool, bonding time, but it was so boring. The plot with Maeve's mother, and her condition - boring. I don't care. Honestly, I think parents that have kids at an old age, especially when they have grown twenty-something-year-old children, are selfish and stupid. Especially in this implied time period! Talk about difficult labor. Maeve is such a daddy's girl... and she never sees that her father treats her like property, just like each of her siblings were treated. I'm sorry, but the entire book deals with this disgusting attitude, and I wasn't having it. I GET IT - in "historical times", sexism was totally a thing. But I didn't like Friesner's portrayal of it. Whether it occurred like that or not, meh. Nahhhh, keep leaving your life and read something else. I don't think this author's books are for me. 2 stars. It was a good attempt! And hey, it's a library book - I'm supporting my public library system, yo! Well, that's disappointing. Meh books are the worst in my opinion. I have seen Brave and it's hard not to think of it when looking at that cover, haha. I'm sorry this was so meh...I think I'll skip it for now. But now I feel ehhh about Brave. I actually really liked Frozen... so I would like Brave more? Ehh, this book might have ruined the movie for me. Meh! Frozen was a musical not a regular movie for me! But I think you ought to give Brave a chance! I've heard some people have loves Friesner's other princess books, but this one sounds more than a little boring and frustrating. Thanks for the heads up! Meh, I didn't like it (clearly), but I've heard the same, actually. I've always wanted to read one of Friesner's novels, but this one didn't really work out for me :/ You're welcome!